Mozilla has released Firefox 36 to the public today, giving fans of the browser a stable version while the beta moves to 37 and the nightly alphas move to 39. On the surface, the update is minor but there are some tweaks under the surface that users should certainly appreciate. 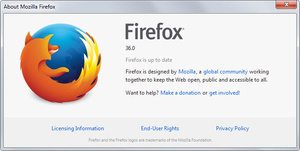 Firefox 36 adds full HTTP/2 support, a newly released update to the HTTP protocol which should lead to faster browsing, reduced bandwidth usage and better security for connections. Additionally, the update includes Partial Media Source Extensions (MSE) support, allowing for better support of native HTML5 playback on YouTube, but only for videos at 720p or under. Finally, Firefox 36 adds 'Flash Protected Mode' which runs Flash as a 'low integrity process.' Basically, if you're terrified of having Flash run but have to have it installed, the protected mode should work wonders. •Pinned tiles on the new tab page are included in Firefox Sync. •1024-bit RSA keys are phased out. •The Crash Reporter is displayed when the shut down hangs. Follow 2 million others here and download Firefox on AfterDawn. lol ok its good to see some supporters are still around. No offense but it seems to have really fallen off. I haven't used it in years and it use to be my favorite browser. Maybe I should download it again and see if I've been missing anything. I like the current firefox but for me it takes a lot of tweaking from it's default install to make it nice and user friendly. To me, it's worth the time though, because I don't like any other browser as well. With all of the high incremental numbers of Firefox version, I plan to wait for Firefox version 126... which will be release August 2015 of this year. August of this year should see Firefox 40.